The EyeCon event last month in Orlando, Florida was Allan Hyde’s first mass encounter with the True Blood fans. The 19 year old Danish actor who portrayed Godric in the second season and who will be back in the third season, tells The Vault how he experienced that weekend. Did you enjoy answering the fans’ questions in the Q&A? At the autograph signing session the fans didn’t bring him anything weird so sign. “Not like Nelsan [Ellis] who got his face tattooed onto this guy’s calf. ;)”. 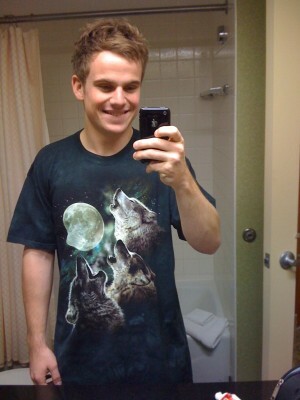 Allan posted a photo on his twitter account where he is wearing a wolf shirt he received from a fan. He plays a vampire… so where does this fascination for wolves come from? One last question for you, Allan. The fans were exhausted after this weekend, how about you? So nice to read Allan’s impressions of the weekend. Such a delightful young man. I am overjoyed that he’ll be returning for Season 3. Thanks for the post, Shad. Shad, thank you for this post on Allan Hyde. 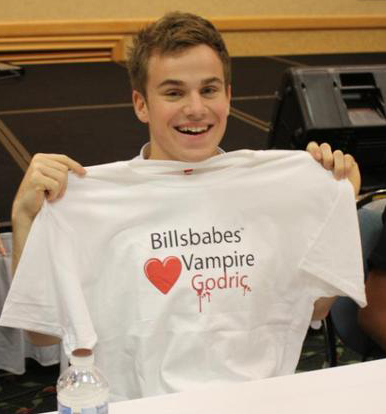 He is so adorable and was awesome as Godric. I really hope we see more of him in flashbacks — I couldn’t stop crying watching the episode when Godric met the sun. Thanks Shad for posting for those of us that do not twitter. Can this kid get any cuter? I enjoyed his impressions of the meet and greet in Orlando. I so enjoyed my time with him in Orlando at Eyecon. This young man is so smart, humble and sincere. He was just a joy to be around. His mother should be very proud. I’m happy to hear that he enjoyed his experience with everyone at the Convention. Allan’s description of Eyecon being intimate and seeing the same people all weekend was spot-on. It was a great feeling to come down to the rooms and see the same people and chat with them the entire weekend. EYECON is really a great convention. Kenny really runs the best convention around. If they have another one, I suggest that you all go. Oh wow, you guys posted the pic! I gave him that shirt. He was so happy when he opened the package and saw it :O) He’s really sweet. We all wish him well and success!!!! Allan is wonderful! It was such a pleasant surprise to meet such a grounded young man. He is funny, smart, friendly, kind, everything you would hope for when you meet a star. I pray he surrounds himself with a solid support system because his talent is extraordinary and he has a very bright future ahead of him!!! This Billsbabe is gaga for Godric!